Radishes not riddled by flea beetle bites—it’s a slightly startling and definitely heartwarming sight! The winding down side of the season has its kinda downbeat MINUSES, like frost watch and wholesale row covering/uncovering, and the one special night when most tender crops get toasted by a hard frost and die (even under cover)… It has its PLUSES as well. 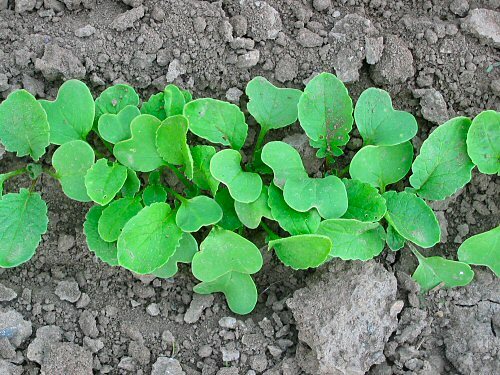 Round about now, pest pressure declines dramatically, soon to vanish, and that includes PIGWEED, and the tiny but savage flea beetles (cucumber beetles stick around in small, determined numbers right into the subzero nights, but their damaging days are over for the year). Also, the need for irrigation is almost certainly over. These Rebel radishes were planted mid-August and with the recent rain, they’ll do well. Over the last few days, we’ve been laying in more beds of radishes, plus lettuce, spinach, zesty brassicas like arugula for salad greens, even some bok choi, in case we catch an extra measure of sun and warmth during the last of the good growing days. Bonus fall crops? With the pests packing it in, pushing for the latest growing date is the easiest gamble of the year! We had our entire crop of White Icicle Radishes eaten to the ground by Cabbage Looper caterpillars this summer, so I can sympathize with you and the flea beetles…I’ve got a new round of brassicas in starter pots waiting for a break in the heat to put in the ground for a fall planting(eh, although I’ll have to replant the five different Bok Choys I put in just before a trip to Baja California…the dear wife didn’t water them enough!). Mercifully, the bugs are backing off a little here too…but not enough to turn our backs just yet. I really enjoy your photography! Those radishes burn so brightly! Mike–Well, there is a cool season in Texas…the fall planting is a gamble from November on–Thanksgiving we were eating dinner outside and a week later it was snowing. They say if you don’t like the weather in Texas just wait 15 minutes and it’ll change! Now, where I lived for the first 47 of my 49 years, in coastal Southern California, you could garden year-round! I even planted Brandywines in February and they finally ran out of steam in December. Must have been great in the old days there to grow vegies for a living. Still, your being confined to a narrow season probably gives you lots of explosive energy in the spring!